Parts of the federal government are currently shut down because of President Donald Trump's demand for $5.7 billion to build a wall on the U.S.–Mexico border. Trump keeps claiming that there's a "security crisis" at the southern border, thanks to the immigrants and drugs allegedly pouring into the country. Only a wall, he argues, will solve this crisis. The facts tell a different story. 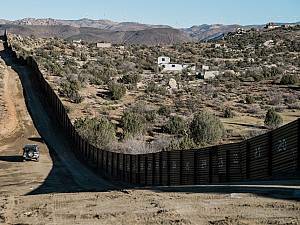 And a report published yesterday from the Center for Migration Studies (CMS) pinpoints two reasons why building a border wall is not necessary. For one thing, most undocumented immigrants don't sneak in over the border. They enter the country legally, then overstay their visas. And it's been that way for a while. In 2016 and 2017, the CMS notes in a press release, "visa overstayers accounted for 62 percent of the newly undocumented, while 38 percent had crossed a border illegally." The report notes that "visa overstays have significantly exceeded illegal border crossings" for seven consecutive years. As David Bier, an immigration policy analyst for the Cato Institute, pointed out in a May 2017 cover story for Reason: "A wall not only will do nothing to stop [visa overstayers] from entering, but it may actually incentivize more people to stick around without authorization." Donald Kerwin of the CMS came to a similar conclusion. "As these numbers indicate, construction of hundreds of more miles of border wall would not address the challenge of irregular migration into our country," he says in a statement. If we really want to curb illegal immigration, our resources are better spent elsewhere, the report suggests. "Since more than one half of all US undocumented residents arrive by air, visa-issuing posts have become the real frontline deterrent to undocumented migration," the study says. "This report suggests that more attention and resources should be given to that crucial mission of the US Department of State." But should we be looking to curb illegal immigration? The undocumented population, especially from Mexico, is actually falling. There were 10,665,000 illegal immigrants living in the U.S. in 2017, down more than a million from 11,725,000 in 2010, the study says. The drop was largely a result of the undocumented population from Mexico falling by more than 1.3 million, from 6.6 million in 2010 to 5.29 million in 2017. This was particularly apparent in 2016 and 2017. More than 500,000 Mexicans left the undocumented population by leaving, dying, or becoming legal residents, compared to less than 150,000 Mexicans who became undocumented residents. That's still an issue. As Dalmia explained in The New York Times on Tuesday, the total share of foreign-born residents living in the U.S. isn't rising fast enough to make up for a projected drop in "the number of working-age Americans with domestic-born parents" by 2035. Again, this means less workers, which in turn could mean stagnant economic growth. Now let's say we do build Trump's border wall. While it wouldn't stop visa overstayers, it would presumably deter many border-crossers from trying to enter the country illegally. At a time when the U.S. arguably needs more immigrants, we'd actually get less. Even if you don't think the U.S. needs more immigrants, the numbers show that net illegal immigration levels are already declining. If this is a "crisis," it's one that's already solving itself. Why should the government seize private land and spend tens of billions of dollars to fix it?